Here’s a first: a skateboard that “can deflate down into a roll-able form, and puff back up when you need it.” We’re not sure what the body is composed of, but the idea of skating around on something that can deflate when punctured isn’t very settling. Click here for first picture in gallery. 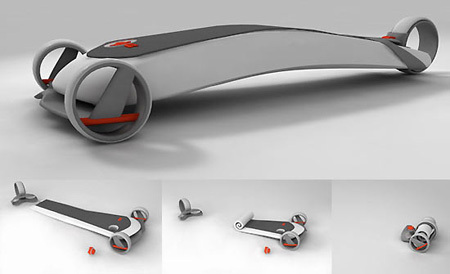 We can see a concept like the Pumpboard being nice for casual travel and it looks nice enough, but, really, you just can’t beat a no-frills skateboard.